There's a myth in the general population that songs are born whole, complete, and radio-ready. Those who write songs know differently. There's the way the song starts in our head, the way it first comes out, the many rewrites, and the various arrangements it takes before it's finally recorded. And even then, if that song becomes a standard piece in your repertoire, it can change forms through concerts, recordings, and covers. 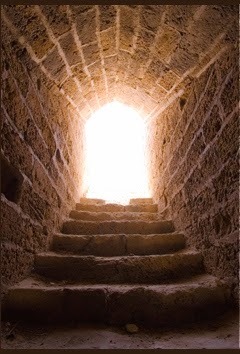 There's A Light At The End Of The Tomb. The twist on the classic "light at the end of the tunnel" hit him immediately. In finding the idea, Gerald writes, "Substituting the word 'tomb,' in the oft used phrase, for the word "tunnel" gave it a deep feeling of possibility… the sense that after the darkest of times that there is an ending and a mercy and grace in this life and the next." From there, we began writing, as Gerald shared with us last year. We knew we had only a few weeks to both write the song and prepare its performance for two Easter services. We decided to each take a solo verse, and sing harmony on the chorus and bridge section. Gerald wrote the first verse and I wrote the second, so our original plan was to sing the verse we each wrote. But as we rehearsed, we each felt drawn to the opposite verses, so we ended up singing each other's writing - an unusual choice for us. It was written on guitar, so we knew that would be the central instrument. We debated scoring it for the band and choir, but time was working against us. Still, this is Easter, and a big song, so to help give us a larger performance, we added in a few extra singers to give us full 4-part harmony on the chorus. We had vocal echoes during the boisterous "Let there be light" section. After singing the huge choruses, we brought it down to a gentle, reverent ending. And that was the debut. But where has the song gone from there? We now sing There's A Light At The End Of The Tomb at the end of every concert. Singing it so often, we've made tweaks in the arrangement to help us better communicate the story and emotion of the song. In this video, recorded during our St. Andrews Musical Residency this winter, you can hear how we've removed the echoes to give "Let there be light" a more deliberate and declamatory presence. We've also changed the gentle ending to a victorious, harmonic cry. We felt this better carried the passion of the song right to the final note. "There's a Light At The End Of The Tomb"
In recent performances, we've made yet another change: we now sing the verses we wrote! Gerald sings the opening verse about the tomb, and I sing Mary's story in the second verse. Technically, we could sing either one, but for us, we feel there's a better balance of the voices with the current arrangement. Next month, we'll go into the studio to start working on our new CD! There's A Light At The End Of the Tomb will be one of the biggest tracks. Gerald's guitar will still be central, but we want a triumphant full band sound. We'll debate adding more harmony to the chorus to give it a choral quality. And we'll be open to the ideas of our producer and musicians - who knows what their creativity will bring to the song? I love that songs are living, breathing pieces of creation. They can stretch and change as our circumstances, talents, and creativity shift and grow. We're constantly revisiting our songs to tweak a lyric, add a new harmony line, or find a new instrumental riff. We want to keep our music interesting, but more than that, we want every word and note to expressively serve the message of the song.